(Purchase, New York) — On December 18, 2016 at 3 pm one of Broadways brightest stars returns to the Concert Hall at the Purchase Performing Arts Center for the Westchester Philharmonic’s Winter Pops! A sold-out seasonal favorite since its introduction a decade ago, Winter Pops!, led by Principal Conductor Ted Sperling, this year welcomes the return of audience favorite, singer Ashley Brown who originated the title role in Mary Poppins on Broadway receiving Outer Critics, Drama League, and Drama Desk nominations for Best Actress. 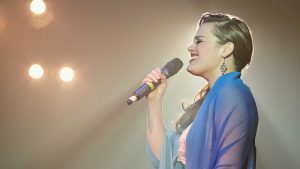 By overwhelmingly popular demand, vocalist Ashley Brown returns to deliver awe-inspiring renditions of What a Wonderful World, Ave Maria, Hello, Young Lovers, and much more. The one-named pianist Ji, whose appearance in the “Android” TV commercial seen during the Grammys instantly went viral and made him a breakout sensation, will dazzle in an audience-favorite selection of Rachmaninoff. This delectable program of popular and classical hits also includes Bernstein’s Candide Overture and the Waltz from Tchaikovsky’s Serenade. Tony award-winning music director Ted Sperling, who has been Principal Conductor of the Westchester Philharmonic since 2014, recently led the rapturously received revivals of Fiddler on the Roof, The King and I and South Pacific on Broadway. He is also Artistic Director of MasterVoices (formerly The Collegiate Chorale), is a consultant to the Public Theater, and is Creative Director of the 24-Hour Musicals. Audiences can keep the holiday fun going at our popular Pops After-Party! Mingle with Ted Sperling, Ashley Brown, Ji and orchestra musicians while enjoying more live music, scrumptious hors d’oeuvres and a wine tasting with Aries Fine Wines & Spirits. Early reservations are a must! Only $30 with a Pops ticket purchase. This entry was posted in Press Releases and tagged ashley brown, broadway, classical music, concert, live show, orchestra, philharmonic, ted sperling. Bookmark the permalink.